All transactions are safe and secure with a reliable history in online purchasing behind each of our associates. 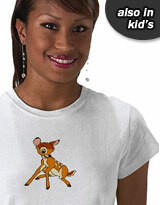 Buy the Bambi Sitting t-shirt to own Bambi clothing and merchandise. Our Bambi tees feature him in an assortment of positions and situations, but this is probably the most well known. It is his sitting position that he often lands in when he is learning to walk or sliding over a frozen lake in the winter. Here, he seems vulnerable yet content, just as he should be. Read more about his life as a young prince living in the forest by getting a Bambi book. It would be a perfect bedtime story for any child. For an ideal combination gift, pair it with a Thumper or Bambi plush to sleep with. In addition to the Bambi Sitting tee above, browse the Bambi Clothing Gallery for more apparel like men's and women's clothes, kids shirts or hoodies.